Guy Rodgers with Board Members Bettina Forget and Kristelle Holliday presenting at ELAN’s 14th AGM. It was a pleasure to see so many of you at ELAN’s 14th Annual General Meeting on August 27th. For those who could not attend, the full AGM package of activity reports, financial statements, budgets and bios is available here. I want to thank outgoing board members Khosro Berahmandi, Amy Blackmore, Farah Fancy, Warona Setshwaelo, Dan Webster, and two board members who served ELAN with dedication and enthusiasm for the maximum period of six years: Rob Lutes, and Vice-President Valerie Buddle. ELAN is an artist-driven network and our community is extremely well served by passionate, knowledgeable directors who contribute a wealth of knowledge. I look forward to working with the newly elected board members, as well as returning board members. ELAN is now embarking on its 15th year and much has changed since 2004. Many of the historical obstacles faced by English-speaking artists in Quebec, important at the time of ELAN’s creation, have decreased as ideas about diversity and inclusion have gained prominence. But as we observed during last year’s consultations for Quebec’s new Cultural Policy, there is still a malaise in some quarters about fully recognizing the value of English-language artists and their contribution to Quebec’s cultural life. The creation of a new Secretariat for Relations with English-Speaking Quebecers (SRESQ) last fall signaled that the government of Quebec is committed to identifying and eliminating barriers, real and received. On August 13th, the SRESQ announced funding for four major long-term projects. The arts and culture project is called Un Nouvel Élan Pour les Artistes Anglophones du Québec (A New Momentum for Québec’s English-Speaking Artists). This three-year project will enable us to identify sources of funding within all culture-related provincial agencies (Conseil des arts et des lettres du Québec, Société de development des enterprises culturelles) and Ministries (Culture and Communications, Education), as well as funding for infrastructure, employment and training, and economic development. Over the next three years, we will work to connect community needs with government resources, and provide community members assistance to write applications. In addition, we will seek to create a working group of artists and senior government officials to continually identify new needs and opportunities. This project has the potential to change the dynamic for Québec’s English-speaking artists in ways that were unimaginable a few years ago. We’ll keep you posted on progress. 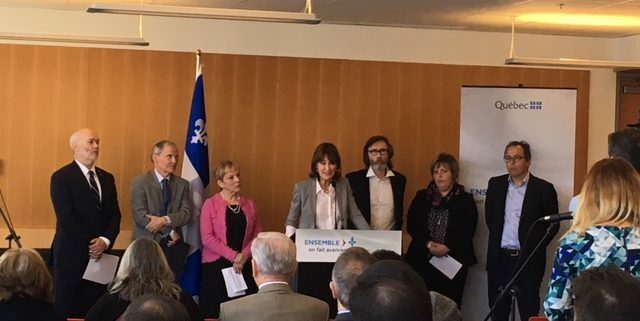 On August 14, 2018, Kathleen Weil (minister responsible for relations with English-speaking Quebecers) announced that $6.9 million will be distributed to four organizations over the course of 3 years to increase and fortify connections between English-speaking artists and the government of Quebec. These organizations include: Community Health and Social Services Network (CHSSN), Literacy Quebec (LQ), Seniors Action Québec (SAQ), and English-Language Arts Network (ELAN). A New Momentum for Quebec’s English-Speaking Artists. Encourage English-language cultural organizations, as well as individual cultural workers and artists to participate fully in social, economic, and cultural life of Quebec. 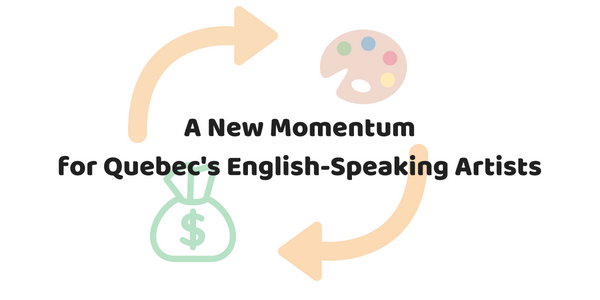 Enhance visibility of English-speaking artists and bolster their capacity to collaborate and work in partnership with the Quebec government. Document arts, culture and heritage funding opportunities. Design a comprehensive directory of active ACH (Arts, Culture, and Heritage) organizations, which includes their missions, audiences, and needs. Create a resource that matches individual artists (and their needs) and cultural organizations (and their needs) with funding opportunities that are currently available. Establish a committee that brings government and ACH community representatives together to brainstorm and initiate projects. Develop an Action Plan to make long-term impact using this project as a building block. In addition to connecting English-language artists to funders and vice-versa, this project will identify new funding sources and help individual artists, as well as arts organizations in our community take full advantage of the support that is available to them. Free entry + Free food + Free drinks! or by selecting ‘Going’on our Facebook event. We’ve had a momentous year and we’re excited to share the results of our work with you! Come out and celebrate our community, and learn about what awaits us next year! Your participation matters to us. Thank you for your engagement! ELAN members in good standing as of August 7 are eligible to vote on important agenda items such as approving ELAN’s budget and electing new board members. Renew your membership by August 7 to ensure your participation! Members in good standing will also be given priority to attend this event. Friend members and observers can’t vote but are welcome to attend! *Audited statements will be available as soon as possible. We thank you for your patience. Today, on April 23, 2018, the Secretariat for Relations with English-speaking Quebecers (SRESQ) announced $950,000 in funding for five community-based projects. The recipients are the English Language Arts Network (ELAN), the Quebec Community Groups Network (QCGN), Quebec English-speaking Communities Research Network (QUESCREN), Council for Anglophone Magdalen Islanders, and Eastern Townships Resource Centre (ETRC). Kathleen Weil, Minister responsible for Access to Information and the Reform of Democratic Institutions and Minister responsible for Relations with English-Speaking Quebecers, announced that the funding will increase the amount of government representation and support provided to English-speaking communities across the province. ELAN has received $230,000 for a two-year project to ‘establish long-term arts education collaborations.’ Based on ELAN’s ACE (Arts, Communities and Education) initiative, this new funding will greatly increase collaborations between artists and educators for the benefit of students. 10 to 15 schools and communities will receive assistance for arts-based projects that will develop transferable skills and creative thinking. Cultural and Education are natural partners, and both are under provincial jurisdiction, however bureaucratic structures have made it difficult in the past for artists and educators to collaborate. This new funding and partnerships demonstrates that the new Anglo Secretariat is fulfilling its mandate of closer collaboration between government ministries and Quebec’s English-speaking communities. The federal Ministry of Canadian Heritage is responsible for funding 12 crown corporations, including Canada Council, Téléfilm, the National Film Board, and CBC. The fund that supports Official Language communities is less visible but extremely important for minority language communities. A significant portion of ELAN’s funding comes from this source, which has also funded some of our largest projects such as Arts Alive! Québec. $10 million for a new Community Media Strategic Fund. The Quebec budget on March 27 was full of election year goodies. After years of austerity and cuts it was certainly a good new budget for artists and cultural workers. Total investment in the Ministry of Culture and Communication will rise to $778 million in 2019/19, an 11% increase. This the largest new investment in culture in 20 years. $11.6 million to make digital video productions eligible for the film and television tax credit. Last year, the Couillard government created a new Anglo Secretariat, which established Arts and Culture as a community priority. The 2018/19 budget provided the Anglo Secretariat with a $24.5 million budget and several projects involving arts and education are waiting to receive financial support. The Commission des droits de la personne et des droits de la jeunesse (CDPDJ) has selected Diversité artistique Montréal (DAM) to hold a local consultation on systemic discrimination and racism in the cultural and media sector. DAM will hold this consultation with Culture Montréal, the English Language Arts Network (ELAN), and Espace Nodal. The consultation will be held in both official languages and will take the form of two types of activities between November 3 and 8. This will encourage all cultural and media stakeholders to voice their opinions. The activities will include public hearings (Nov. 8) and closed discussion groups (Nov. 3-7) to provide a safe space for testimonies. It will also be possible to post anonymous testimonies on the CDPDJ website. Racialized English-speaking artists, cultural workers, media professionals, students, cultural development stakeholders, and citizens are welcome and encouraged to contribute their stories. Please consult the call for participation for more information. The deadline to register is October 29. Read DAM’s press release here.